New Ghostbusters TV Spot: Who Ya Gonna Call? It's a little under a month until the much talked-about Ghostbusters reboot hits theaters, at which point fans new and old alike can finally find out if this reimagining of the supernatural comedy franchise can live up to the hype and/or shut down the waves of negative online backlash that have preceded it since the project was first announced. Screenwriter Katie Dippold and Spy writer/director Paul Feig (who previously collaborated on The Heat) are leading the charge on the film behind the camera and will finally get to see their efforts come to fruition this summer (after having worked on the project for some 2-3 years). Sony Pictures Entertainment has now released another TV spot has dropped for the Ghostbusters reboot, once again highlighting the ghost-busting antics of stars Kristin Wiig (The Martian) and Melissa McCarthy (The Boss), as well as Saturday Night Live veterans Leslie Jonesand Katie McKinnon. You can watch that preview, above. While the newest Ghostbusters TV spot doesn't feature significant amounts of new footage, it reaffirms the idea that the new Ghostbusters are a team of outsiders who have to contend just as much with skepticism of their work as with the malevolent ghosts themselves; as McCarthy's character puts it, they "see things that others aren't willing to see." This was a theme of the original 1984 Ghostbusters movie and has been highlighted in multiple trailers and TV spots for the reboot by this point, too. One new shot featured here offers greater context to one of the film's major setpieces, as the Ghostbusters are shown conversing with a concierge in what looks to be the lobby of an old hotel that has been taken over by the merchandise booths of a rock band. 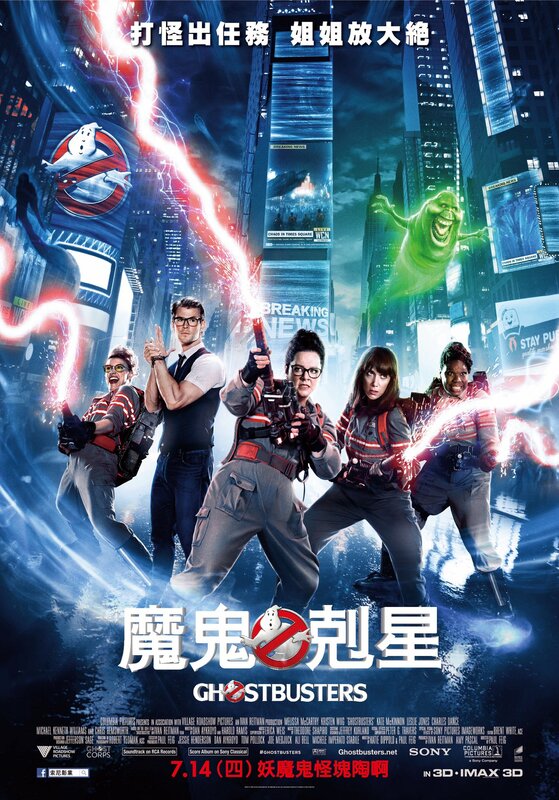 Given that the merchandise uses the same logo as the band seen in the sequences where the main characters are fighting a dragon ghost, the suggestion is that this is the new film's version of the hotel sequence from the original Ghostbusters; where the three founding 'Busters successfully trap their first ghost (the green shot known as Slimer) at a fancy New York hotel. A new version of Slimer has been featured in other previews for the reboot already, along with the reboot's version of the Stay-Puft Marshmallow Man. The latest Ghostbusters TV spot also features a brief excerpt from the new version of the Ghostbusters theme song, which has been recorded as a collaboration between Missy Elliot and the band Fall Out Boy. Elliot's voice can be heard on the soundtrack starting at 00:18 saying "On then closet/down the hall/I see shadows up on my wall", suggesting that the new theme song will include a spoken/rapped element. The original theme song, by Ray Parker Jr., was performed and recorded in a dance-pop style typical of the '80s. While this new Ghostbusters spot likely won't change any minds in terms of those already committed to seeing or not seeing the film, it's worth noting that the marketing has settled into a place where a clearer image of the finished film has begun to emerge. Feig has discussed the challenges of marketing his comedies in general in the past, noting that much of their humor is contextual and not easily compressed into trailer and TV commercial form. As such, it's not yet clear how much these Ghostbusters TV spots and trailers are reflective of the actual film - or are geared towards selling the film that Sony thinks its audience wants to see.